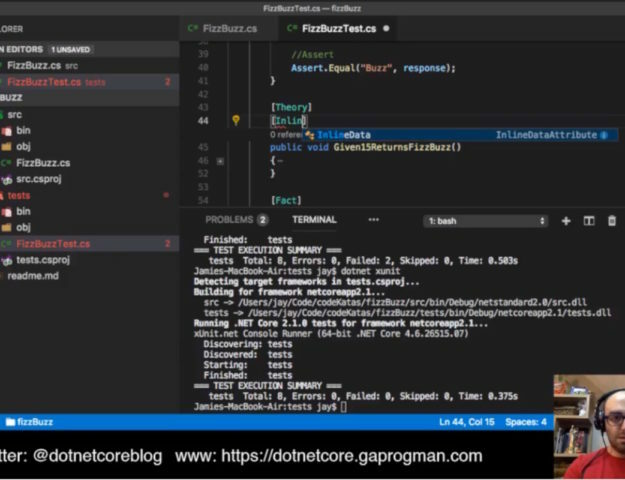 Last week I did a deep dive into how the Angular2 SPA template worked, including looking at some of the features that the new Microsoft.AspNetCore.SpaServices namespace gives us. This week, we’re going to use that template to build a front end application for the web-api project that we built together in the web-api tutorial series. We’ll use a published version of that app (although you can use any app that you want) as a server of sorts, sending it GET requests, parsing the responses into a view model and getting Angular to update the relevant views for our SPA with the parsed data using two way binding. I’ve already uploaded the source code to GitHub, so if you wanted to skip the blog post and go straight to the code, you can do that here. 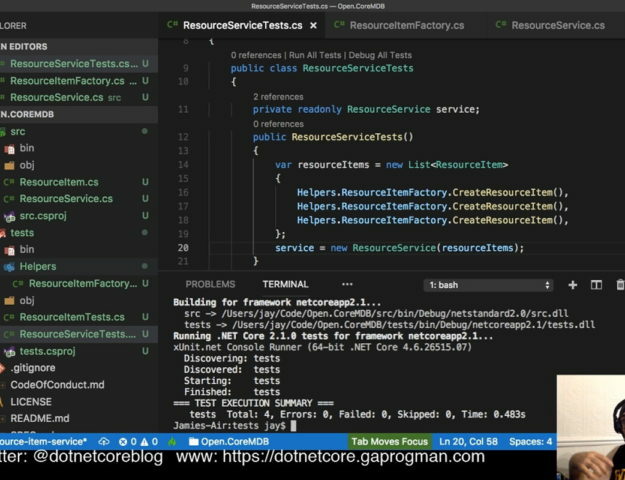 As with the previous post on the SPA templates, you’ll need to have .NET Core 1.0.1 or greater, node.js and the SPA templates installed on you development machine. Other than that, you’ll need some kind of web service to talk to. I’m going to use the published version of dwCheckApi, the address of which is: http://dwcheckapi.azurewebsites.net/. You’re welcome to use this service for development and for following along with this post, if you’d like. The only caveat is that it’s hosted on a free Azure service, so it might be slow to respond from time to time. 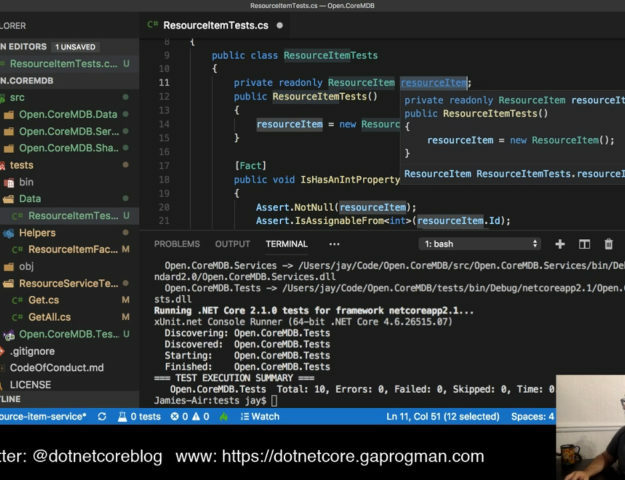 Creating a new .NET Core project using the SPA template is pretty simple. However, at the time of publishing this blog post, there is no way to access these templates from the New Project wizards in any of the Visual Studio IDEs. I’m referring to Visual Studio, Visual Studio for Mac, Xamarin Studio, and Visual Studio Code. then you’ll need to install the SPA templates before continuing. The template "MVC ASP.NET Core with Angular" created successfully. Once the packages have been restored, we’re finally ready to run the application. It’s always good to test that we’ve set everything up correctly before we start developing. Now that we have the application running, it’s time to open the project with our favourite IDE. I’m going to use VS Code. If you’re going to use Visual Studio Code, then leaving the application running is an important part to building this project. This is because of the inclusion of the webpack middlewear and hot module replacement, each time we make a change to our client side scripts they will be repackaged and sent to the open browser and swapped out as our application is running. All this without the need to refresh the underlying page, too. However, if you’re going to open the project with Visual Studio, Visual Studio for Mac, Xamarin Studio or Project Rider, then I’d recommend closing the application first and running it from within those IDEs. 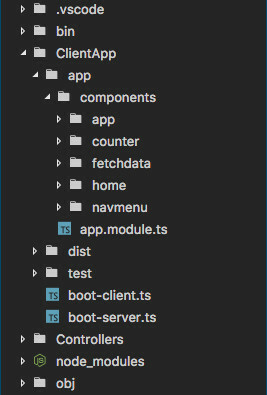 Taking a look at the directory structure for the client side code (which you’ll find in the ClientApp directory), you’ll see that our client side application code is split into components. The project currently has one component per Angular route and we’ll leave it set up like that for now. The accepted practise is to name the directory after the component, and to name the files within it the same way, but appending ‘.component’ before the file type. 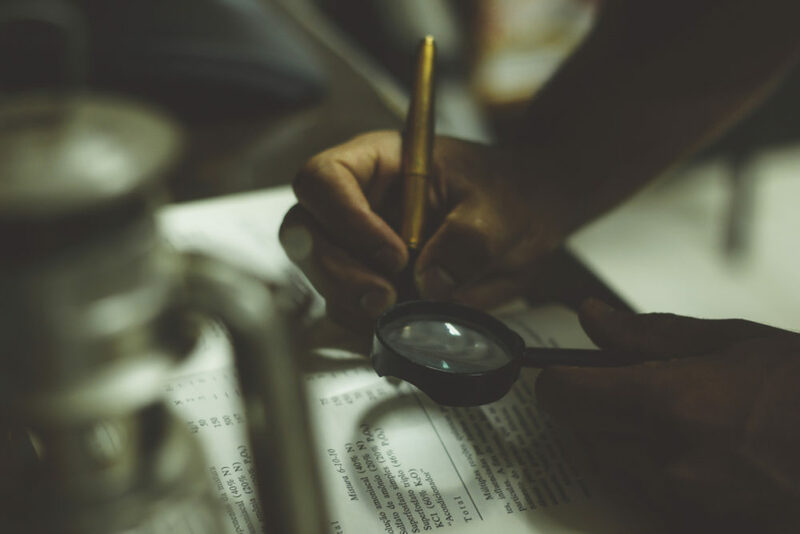 The books component TypeScript doesn’t contain code which is too complicated, but let’s take a look at it. We need to import the core module to access Angular’s core functionality, without it we wouldn’t be able to add the component meta data. We need to import the http module to gain access to Angular’s http get method – which performs an Ajax get for us. Without this, we’d have to depend on jQuery or write our own XMLHttpRequest code. Since Angular supplies this for us, there’s no point in writing our own. We’re using the Component decorator to tell Angular that our class will be an Angular component. The Component decorator takes in meta data about our class, and uses that meta data when we access it via markup or routing. We only need to supply the templateUrl field for this component. This field tells Angular where to find the HTML to add to the DOM when this component is requested. The template file is always external to and relative to the TypeScript. It also uses Unix-like file paths: all directories are separated by forward slashes, and a leading dot or period means “current working directory”. This is so that you can be sure whether the query succeeded or failed, before parsing the JSON result text. We could have created a TypeScript Interface for the Book Class, but it was such a simple class (and we’re not using it anywhere else in this demo) that I thought, for this example at least, we didn’t need one. The part that caught me out about Angular’s http get method was that the response doesn’t come back in the same format as was sent from the server. The response variable returned by the http get method is of type “Response”. As such, when the response comes back we parse the json property of it to a ResultJson object. Then, if the response indicated that it was successful, we parse the result portion of it to an array of Book objects. This is definitely not the best way to do handle the response from the server, mainly because it’s not strongly typed. But I feel like it’s a good way to get across the idea that the response from Angular’s http get method is not in the format that the server provides it (or what you might expect, if you’ve only ever used jQuery to do XMLHttpRequests). In a real world application, I would have preferred a method to parse the returned data and deal with it using array.map. As the value of the input box changes, it’s new value is written to the searchString variable. 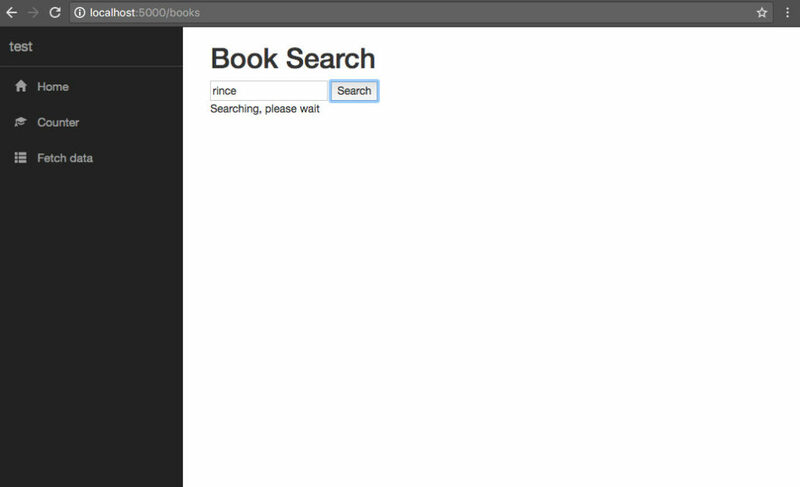 The results are only shown if we’re not loading and there are entries in the books variable. This is why we new it up every time that we perform a search, performance wise this isn’t the best either. But I doubt that the get method will be being performed and returning data at a rate which could cause serious issues. the webapi application being on free Azure hosting will, no doubt, help towards that. In a real world application you would clear the array each time, rather than setting it equal to a new instance of an array. 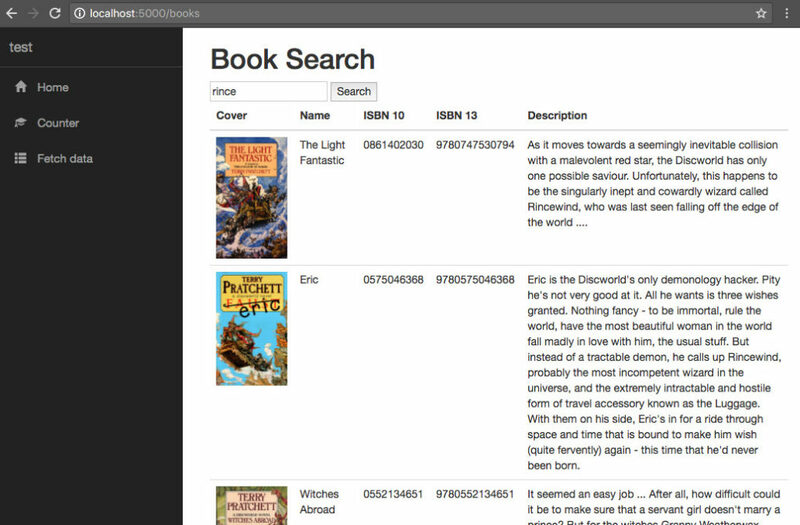 The table body is rendered with a row for each book entry in the Array of books, and the value of each table data element is set using the handlebar notation (which comes directly from the first version of Angular). Click here to jump to that section of last week’s post. 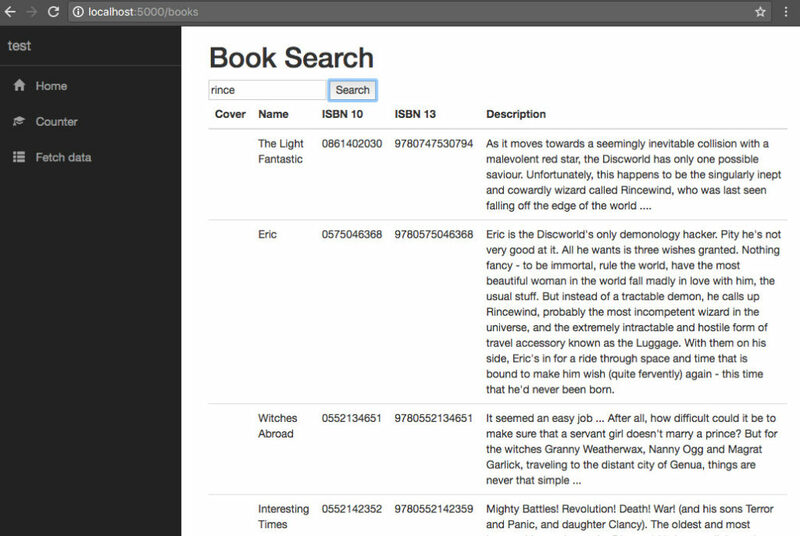 The last thing that we need to do, in order to make this a useable single page application is to add a link to the books view on the navmenu. The routerLinkActive directive is used to apply a class (or a number of classes) to an element when the page URL matches that of the routerLink URL. In our code, we’re applying the ‘link-active’ class. The routerLink directive takes an array of route names and a collection of query parameters, and these are parsed into full href tags. Here we’re passing ‘/books’ to our button. I’ve done a search in this screenshot, to show that everything is working as before. and even connected it to a real service, and used that service to get data. The future for SPAs is quite exciting, especially if you can build a useful one in under an hour. 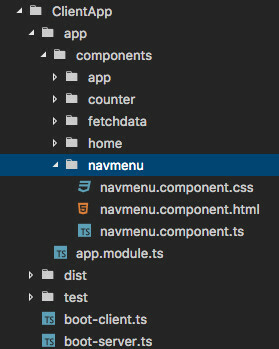 Have you built any Angular2 SPAs with the template pack that Microsoft have supplied? If not, are you more willing to do so now that Microsoft have released these template packs?